I have said time and time again that this generation may be my favorite time in gaming. Never before has there been a time where both the old and the new take the same stage so often together. It allows us to both explore new horizons while still having our roots on display for all to see. R-Type is one of those classic games I lucked across in my childhood, and I took it everywhere with me. 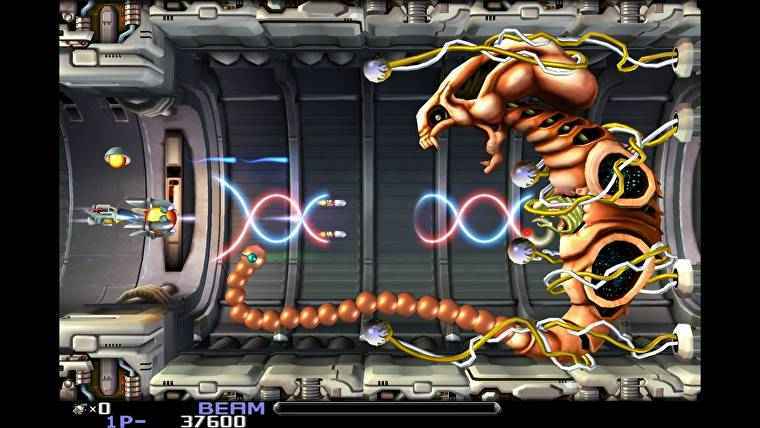 Sure, it was on Game Boy back then, but R-Type is now available almost everywhere. Such is this package, R-Type Dimensions Ex, featuring both the first and second original games in one package. The premise in these games is quite simple: Fly from left to right and shoot everything that moves. What I always liked about R-Type over most bullet-hell-esque games is that it requires more discipline than reaction time. There is plenty of projectiles flying across the screen, but nothing comes in copious amounts. Speeds of enemies and weapons vary between each new target, requiring a level of discipline on all fronts that most games like it do not require. Most are simply fast-past with everything flying at the same speed. R-Type asks for more than that. Sure, memorizing the actions still yields success. The choreography is simply more complicated than fast reflexes. These two games come with their own customization options as well. Initially, the game delivers an updated visual style that, to me, appeared quite childish at the onset. This is mostly due to my expecting to see the old 8-bit style. Still, it put me off for a while. I toggled back and forth between the old and new visuals. Oh, and a simple press of the Triangle Button toggles that on the fly. Local co-op makes this a great romp as well! Sure, online is not an option, but you and a friend or family member can take to the enemy together. Doing so does make things a bit easier for sure. I am glad this option remains intact. I learned that playing with updated graphics made it easier. Not in that anything changed in game mechanics, but the on-screen action took less time to interpret. Colors and shapes are more distinctive in the HD visuals. I think this is a good addition for newcomers, honestly. It keeps the old challenge while making it still accessible. Having the option to adjust button layouts is handy as well. However, it’s not quite as intuitive as I would like. The buttons you can adjust stay the same. Rather, instead of just switching out the button for each command, you change the command for that button. It still gets the job done, but I would have preferred to have firing on one of the triggers instead of R1. It’s not a game breaker by any means, but it seems more cumbersome than it should be. Also, I know it is not a favored device anymore, but this package would have been phenomenal on the Vita. R-Type Dimensions EX has a specific audience in mind, but that audience is not isolated. Rather, it is for anyone either looking for a nostalgic trip or someone looking to explore the early days of the genre. Button customization is not as intuitive as it could be, and visuals can take some getting used to, depending on your previous experiences. However, R-Type has a place in any library, new or old, and R-Type Dimensions EX is a great addition to any library.